Laryngeal stridor immediately after birth is usually due to airway obstruction and needs evaluation for common causes that include structural abnormalities like laryngomalacia, laryngeal webs, laryngeal stenosis, vocal cord paralysis and extrinsic compressions. Diagnosis and management of these babies could be quite challenging. Congenital aneurysm of ductus arteriosus (DAA) is a rare condition caused by saccular dilatation of ductus arteriosus and is an important cause of extrinsic compression on the airways, producing stertorous breathing in the newborn. , Diagnosis of DAA can be clinched by an echocardiogram when there is high degree of clinical suspicion. We report the clinical course in four neonates who presented with stridor within 24 hours of birth due to congenital DAA. The series comprises two male and two female babies. Their salient characteristics are presented in [Table 1]. All neonates presented within 24 hours after birth with respiratory distress, intercostal retractions, inspiratory stridor and feeble cry. Examination of the cardiovascular system revealed normal heart sounds and no significant murmur. Transthoracic echocardiogram was performed to rule out any structural cardiac anomaly in the wake of symptoms being disproportionate to a normal looking chest skiagram. 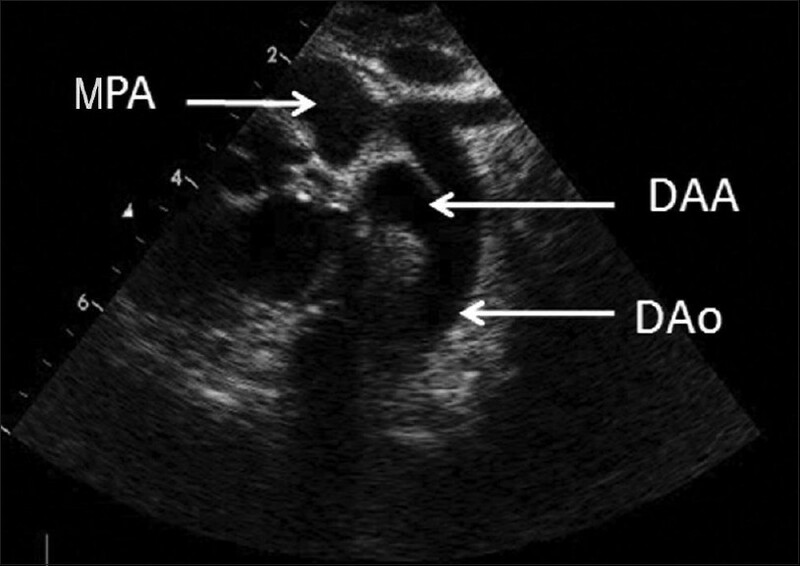 An echocardiographic diagnosis of DAA was made in all the four cases based on the presence of saccular dilatation of the ductus arteriosus - the maximum internal diameter being larger than the adjacent transverse arch or the descending thoracic aorta. In the initial 24-48 hours, a small eccentric jet producing left to right shunt was commonly demonstrable through the patent ductus arteriosus (PDA) [Figure 1]. The suprasternal and high parasternal views showed the typical echocardiographic features termed the "triple star sign"  constituted by the ductus aneurysm, the ascending aorta and the main pulmonary artery (PA) [Figure 2]. The maximum internal diameter of DAA ranged from 12.5 to 20 mm. All the babies were closely monitored and assessed by periodic echocardiograms. Case 1 was a full-term baby who developed symptoms of respiratory distress and stridor immediately after birth. He developed frequent episodes of apnea and required ventilatory support. 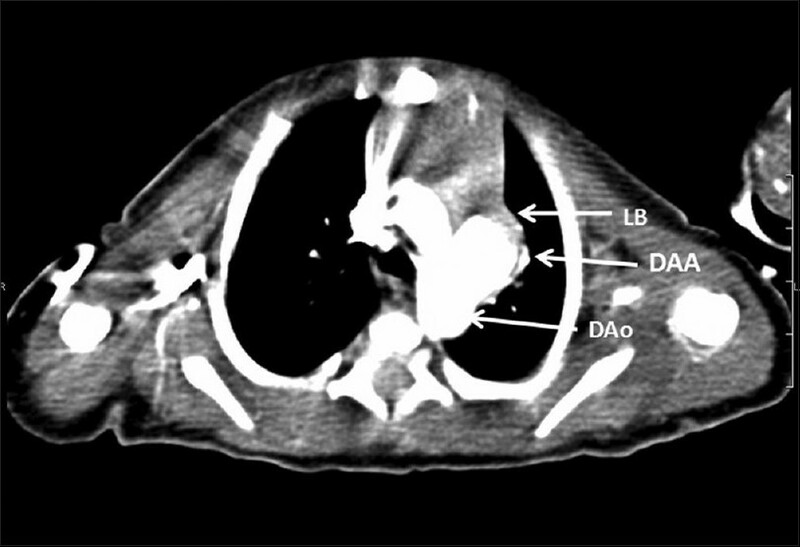 A computerized tomography scan (CT) scan showed compression of left main bronchus by DAA [Figure 3]. This baby underwent surgical resection of DAA through a left lateral thoracotomy on the fifth day because of persistence of obstructive symptoms. He showed remarkable improvement after the surgery; there were no perioperative complications. Gross examination of the specimen showed loculations filled with thrombus [Figure 4]. Histological examination confirmed the presence of only ductal tissue and no pathology. Case 2 was a late preterm (36 weeks) baby with a birth weight of 2100 g, who presented within 12 hours of delivery. Symptoms subsided after 72 hours; serial echocardiograms showed spontaneous resolution of DAA. Case 3 was born to a mother suffering from insulin-dependent gestational diabetes mellitus. The baby had characteristic features of an infant of a diabetic mother, such as large size with a birth weight of 3500 g, hairy pinna, and also an episode of hypoglycemia which was corrected by appropriate measures. She developed cyanosis and stridor within 24 hours of birth and required mechanical ventilator support. No cause for respiratory distress other than DAA was identifiable [Figure 5]. The baby improved in 48 hours with conservative management. Case 4 was a full-term baby who presented with stridor and feeble cry. He was followed conservatively with serial echocardiograms. CT scan confirmed the presence of a large DAA with layered thrombus in the cavity of the aneurysm [Figure 6]. 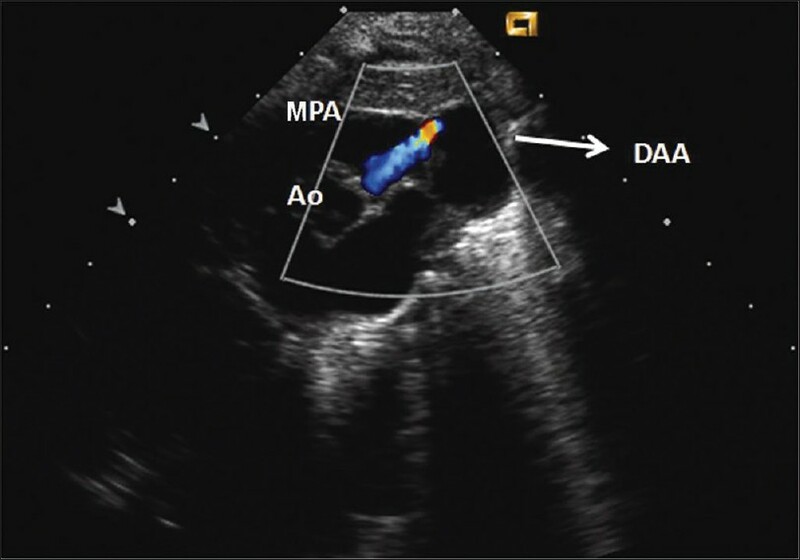 Serial echocardiography over a period of 6 weeks to 3 months in the three neonates managed medically demonstrated spontaneous regression of DAA through stages of loculation followed by thrombus formation and the organization of thrombus resulting in obliteration of aneurysmal cavity [Figure 2]a-d.
None of the babies received indomethacin or diuretics. Congenital DAA is generally asymptomatic and often goes unnoticed in majority of the neonates. Although the true incidence of large DAA is unknown, in a prospective study, Jan et al., with their liberal diagnostic criteria, reported a rather high incidence of 8.8% in contrast to some of the previous case reports which were essentially anecdotal. ,,, It is rare for symptomatic DAA to manifest within 24 hours of birth, , and the symptoms are commonly due to complications like spontaneous rupture, thromboembolism, infection, erosion into airways, or compression of adjacent thoracic structures. ,,,, But in our series, all the four neonates had presented a few hours after birth with stridor and feeble cry on account of compression of adjacent thoracic structures by a large DAA; their giant size (maximum internal mean diameter of 15.9 ± 3.5 mm) probably is the reason for the early presentation. Although all four neonates presented with symptoms within 24 hours after birth, only one required surgery. In the series of Dyamenahalli et al.,  symptoms attributable to DAA were seen only in 4 of 15 cases diagnosed postnatally. 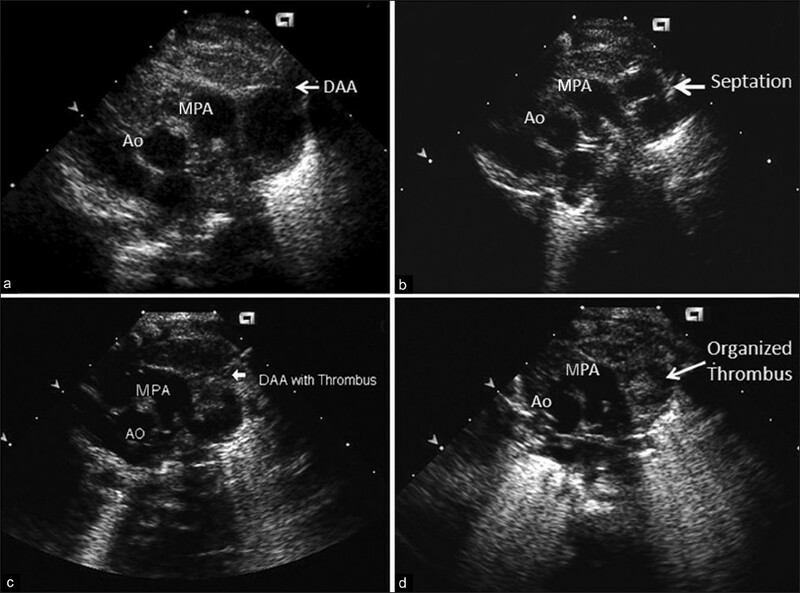 Several case reports have described the natural history of DAA in asymptomatic neonates as passing through stages of constriction, thickening and subsequent thrombus formation, leading to its closure. , In our series, the symptoms of DAA subsided within 3-5 days in the three neonates managed conservatively. Serial echocardiograms showed thrombus formation and obliteration of the cavity in these cases over a period of 6 weeks to 3 months. We observed four stages during the course of spontaneous regression of DAA [Figure 2]a-d by serial transthoracic echocardiograms in our series: (a) the stage of compression : A thin-walled DAA with large, saccular dilatation causing compressive symptoms, often terminating as a small tortuous PDA with an eccentric jet directed into PA; (b) the stage of loculation : This transient stage follows the spontaneous closure of PDA and is characterized by the formation of multiple septae or loculations within DAA and relief of symptoms; (c) the stage of thrombus formation : A thin layer of soft thrombus developing along the wall of the aneurysm by the end of the first week or beginning of the second week results in reduction of the size of the aneurysm; and (d) the stage of organization: Organization of the thrombus leads to obliteration of the aneurysm cavity and is noticeable over 6 weeks to 3 months time in serial echocardiograms. Spontaneous regression of DAA is common, so the symptoms are generally transient. The amelioration of symptoms in large DAA is probably the result of formation of loculation and septae leading to dispersion of aortic pressure within the aneurysmal cavity and the regression of the size of DAA by organization of the thrombus, causing relief of pressure on the adjacent thoracic structures. Thrombus formation was noted in 30% of cases in the series of Jan et al. CT scan and magnetic resonance imaging (MRI) are useful tools to delineate the extent of DAA and degree of compression of the surrounding structures. Two of the cases in our study group underwent CT scan of the thorax which demonstrated compression of left main bronchus in one and thrombus formation in the other. Persistence of symptoms is rare and generally needs intervention due to complications of DAA. In our present series, only one baby had persistent stridor due to compression by DAA and was subject to surgical resection by left lateral thoracotomy. Hornung et al. reported surgical treatment by decompression without excision in a symptomatic neonate. In the retrospective review by Dyamenahalli et al.,  7 of 24 cases had undergone surgery because of large DAA in 3, suspected thrombus in 2, hemodynamically significant PDA with pulmonary hypertension in 1, and for diagnostic exploration in another. The authors of this retrospective review have recommended surgical excision of DAA in case of persistence of PDA beyond the neonatal period, or propagation of thrombus into adjacent vessels, or thromboembolism, or significant compression of adjacent structures, or when associated with connective tissue disorder. , It would appear that the mere presence of large DAA (10 mm) in itself is not an indication for surgery, well noticeable in our series. It is imperative to observe the progress of symptoms carefully in isolated large DAA and watch for the occurrence of one of the associations mentioned above before deciding on surgical intervention at that tender age. Close clinical observation and serial echocardiograms would identify high-risk cases that require surgical intervention. 1. Mancuso RF. Stridor in neonates. Pediatric Clin North Am 1996;43:1339-56. 2. Das BB, Solowiejczyk DE, Kamath V, Sharma J. Congenital ductus arteriosus aneurysm presenting with stridor in a Newborn. J Perinatol 2002;22,179-80. 3. Hornung TS, Nicholson IA, Nunn GR, Hawker RE. Neonatal ductus arteriosus aneurysm causing nerve palsies and airway compression: Surgical treatment by decompression without excision. Pediatr Cardiol 1999;20:158-60. 4. Lund JT, Hansen D, Brocks V, Jensen MB, Jacobsen JR. Aneurysm of the ductus arteriosus in the Neonate: Three case reports with a review of the literature. Pediatr Cardiol 1992;13:222-6. 5. Jan SL, Hwang B, Fu YC, Chai JW, Chi CS. Isolated neonatal ductus arteriosus aneurysm. J Am Coll Cardiol 2002;39:342-7. 6. Dyamenahalli U, Smallhorn JF, Geva T, Fouron JC, Cairns P, Jutras L, et al. Isolated ductus arteriosus aneurysm in the fetus and infant: A multi-institutional experience. J Am Coll Cardiol 2000;36:262-9. 7. Better DJ, Timchak DM, Allan LD. Prenatal diagnosis of aneurysm of the arterial duct: Postnatal management and literature review. Cardiol Young 1997;7:160-2. 8. Maisel P, Brenner J. Spontaneous closure and thrombosis of a ductal aneurysm in a neonate. Cardiol Young 1999;9:503-5. 9. Tsai IC, Fu YC, Jan SL, Lin MC, Ho CL, Hwang B. Spontaneous regression of a large ductus arteriosus aneurysm in a Neonate. J Pediatr 2008;153:43. 10. Hornberger LK. Editorial Comment: Congenital ductus arteriosus aneurysm. J Am Coll Cardiol 2002;39:348-50. Hauser, M., Kleinlein, B., Hiener, U.